Prospect is a portfolio of freestanding furniture designed to foster collaborative and individual creativity in workplaces and classrooms. 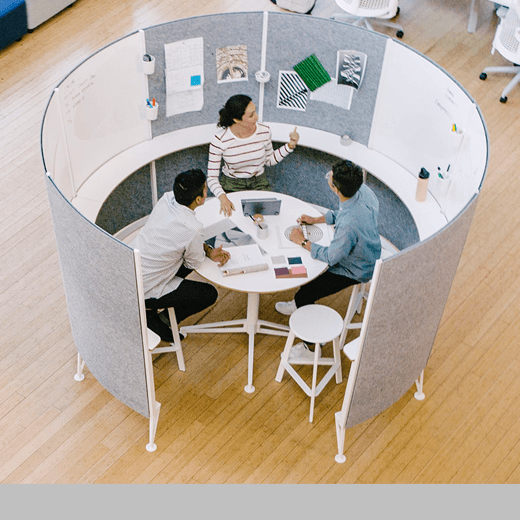 Intended for small- to medium-size teams, Prospect is an oasis for co-creation featuring whiteboards, tack-able surfaces and media display. The Creative Space provides an ideal setting for groups to collaborate, brainstorm and think visually together. The Solo Space is meant for focused individual work, an escape from the distractions of the office. The Media Space allows people to present, review and collaborate on digital work. These settings create ideal places for collaboration, allowing people to easily bounce between working together and working alone. Designed by: Richard Holbrook, Darren Mark and Theo Mandin-Lee of Richard Holbrook (design) for Herman Miller Inc.